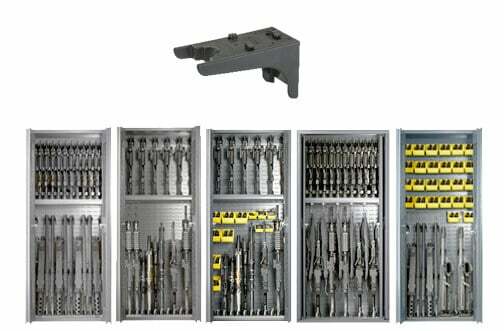 Most existing weapon storage systems are proprietary, meaning that they are closed systems and all parts and components must come from the manufacturer or their dealer. Manufacturers like proprietary systems because it forces every customer to return when they need to add to a system or make changes. Marketing and sales materials have statements like: “Unique weapon storage systems”, “Combined the extensive components” While this may sound impressive, what is it really saying? It’s unique, meaning you are tied to this company and will not have access to competing technologies. The cost of updating and maintaining a proprietary system can be higher. In many cases, it is impossible to source the proper components for a proprietary rack system due to time constraints, finance or contracting. Units are forced to make do with what they have and you end up with weapon racks like this. Long-term use and sustainability will be difficult. If you are deploying with a proprietary weapon storage system, it will be impossible to make any changes down range. Careful consideration must be made to assure you have a system in place that allows you to easily source storage components. COTS – (Commercial off the shelf) products are easy to get and typically very affordable due to retail price pressures and competition. When looking at new weapon storage systems, put a high value on COTS capabilities. SecureIt Tactical racks are unique in that all storage bins, trays, and hooks are readily available from any hardware store. Parts are very affordable and can usually be sourced at downrange locations. In the early 2000s when we were working with the Dasco system (a Canadian import system now sold under the names SEKURE, DLS and a few others), we had several conversations about propriety and compatibility. We pushed for more open architecture and broad compatibility with competing systems. Their view was that it had to be proprietary so that every time a rack was sold the customer had to come back to them for accessories. It was at that time that we started development of the Tactical Weapon Storage Platform. When we set out to develop our weapon storage system, one of our core capabilities was open architecture and compatibility with a wide variety of products. Our view is that the system must be easily reconfigured with readily available materials, especially when working down range. A deployed unit does not have the ability to order new or different brackets. They have to make do with what they have. The Tactical Storage platform is compatible with most competing weapon storage systems on the market, meaning that you can use their components in our rack if needed. Proprietary systems have very limited capabilities when it comes to gear storage. Most offer a few metal trays or boxes. These may look good in a company brochure or a cad drawing but in the real world, they simply are not very flexible. With proprietary systems, your only option is to use what the manufacturer has available. Open systems allow you to use a wide variety of bins, boxes, and baskets available at most hardware stores. When using an open system, you will have the ability to quickly and affordably solve your own challenges. To affordably address these old complex weapon racks. SecureIt has developed a “retrofit kit”. It is designed to replace the interior these old rack systems. Instead of scrapping old weapon racks entirely, military units can now upgrade their old units to the modern standard. If the old weapon rack shell or cabinet is good shape, the SecureIt kit can be easily installed in minutes. Military units can save upwards of 70% off the total cost of an armory renovation. The kits are simple to install and are affordable. 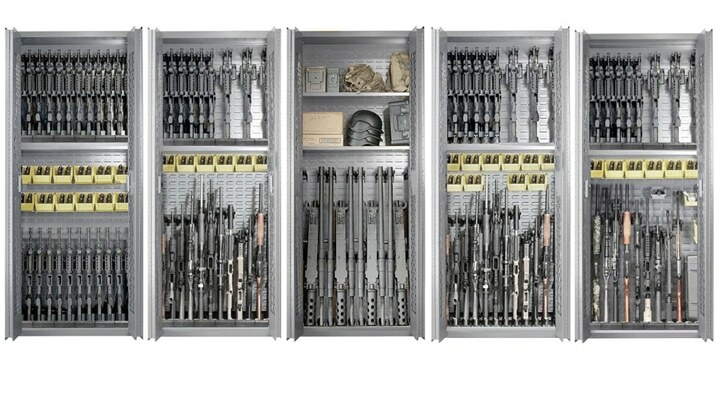 Once installed, operators have complete control and flexibility in weapon storage layout and armory workflow. The SecureIt Weapon Storage Platform will store any rifle, shotgun, crew-served weapon, and most shoulder-launched weapon systems. There are no unique brackets or extra components required when you need to make changes. A SecureIt weapon storage platform upgrade with CradleGrid technology is an affordable and easy to install solution that will bring your old, inefficient armory up to modern standards at a fraction of the cost of new weapon racks. The Gun Storage Guru Considered the leading authority on weapon storage and armory design. Tom has designed and built weapon storage systems for all branches of the US military in all theaters of operation as well as foreign military forces in South America and the Middle East.